The sale and use of non-essential herbicides is restricted in Manitoba. This legislation is embedded in The Environment Act, which received royal assent on Jun 12, 2014 and the Non-Essential Pesticide Use Regulation. Review of this legislation is underway, but current legislation remains in effect. 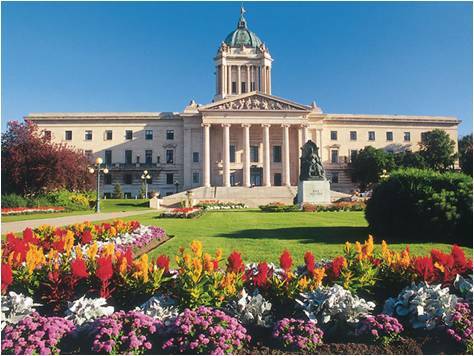 Manitoba Legislature lawn does not use synthetic pesticides. Please follow the links below to find out what the new legislation means. The legislation applies to lawns and adjoining areas (sidewalks, driveways and patios) of residential, commercial, government, and institutional properties. The prohibition of the use of certain prescribed pesticides extends to any exterior property of a school, hospital or child care centre and includes parking areas, pathways, any area around play structures where children play or have access. The intent of the legislation is to reduce exposure of people and pets to pesticides used in lawn care for non-essential ("cosmetic") purposes. Homeowners are not able to purchase or use certain prescribed pesticides for cosmetic purposes on lawns, driveways, and patios. The legislation allows only federally-approved low-risk pesticide products including biopesticides and other non-conventional pesticides to be sold or used in Manitoba for lawn care. Further, lawn care companies are only allowed to use federally-approved low-risk pesticide products including biopesticides and other non-conventional pesticides on lawns and any exterior property of a school, hospital or child care centre. The Non-Essential Pesticide Use Regulation under The Environment Act has been registered and will come into force on January 1, 2015. Agricultural sector (including ornamental, vegetable and fruit gardens). Forestry activities, golf course operations, use on turf or sod farms. To protect public health or safety for which no effective alternative exists. Control of high-risk noxious weeds and poisonous or invasive species. January 1, 2015 - Regulation MR 286/2015 was proclaimed. Use of certain prescribed pesticides on lawns and adjoining areas, such as sidewalks, driveways and patios will be restricted. Exceptions would include uses for the protection of public health or safety, control of high-risk noxious weeds, poisonous or invasive species for which no effective alternative exists. The legislation allows only federally-approved low-risk pesticide products including biopesticides and other non-conventional pesticides to be sold or used in Manitoba for lawn care. Lawn care professionals would only apply federally-approved low-risk pesticide products including biopesticides and other non-conventional pesticides for lawn care. Exceptions would include uses for the protection of public health or safety, control of high-risk noxious weeds, poisonous or invasive species for which no effective alternative exists. Government Departments and Agencies will be required to comply with an Integrated Pest Management (IPM) policy which is under development. The new legislation will not conflict with the responsibilities of Weed Supervisors under The Noxious Weeds Act. However, the use of prescribed pesticides will be prohibited for use on any exterior property of a school, hospital or child care centre, including parking areas, pathways, and areas around play structures. The legislation is intended to restrict the sale and use of prescribed pesticide products. Retailers will be required to secure these products. Retailers will be able to sell federally-approved low-risk pesticide products including biopesticides and other non-conventional pesticides without restriction. Who is deemed a trained employee? *For each employee responsible to dispense products not on the 'allowable list' a copy of a completed, successful Self Assessment Questionnaire should be maintained on the site. Mowing: Cut your grass to a height of 2.5 to 3 inches during spring and fall, in the summer months to a height of 4 inches with a sharp blade when the lawn is dry. Watering: Water your lawn in the morning, about 1 inch, only when needed (usually no more than once a week). Feeding: Fertilize with natural fertilizers. Let grass clippings stay on your lawn to provide nutrients. Aerating: Aerate compacted soil; either in the spring or the early fall. Overseeding and topdressing: Overseeding in combination with topdressing should be done in cool weather, such as May or September over thinned areas. Spring and Fall Raking: Remove remaining leaf litter or debris after the snow has melted in spring. Remove all the heavy leaf cover, and any thatch that has developed to an excess of ¼ inch thick in fall. Weed and pest Control: A few weeds or insect pests in healthy lawns are usually not cause for concern. If any weeds become a problem, the best method of control is to hand pull them. Regularly inspect your garden for signs of insect infestation. Ask a lawn and garden expert, garden centre or landscape company for advice. A pesticide is any substance or mixture of substances intended for preventing, destroying, repelling, or mitigating any pest. The term “pesticide” not only refers to insecticides; it also applies to herbicides, fungicides, and various other substances used to control pests. A pesticide must be registered under The Pest Control Products Act (PCPA) administered by Health Canada's Pest Management Regulatory Agency (PMRA) and designated for legal sale and use in Manitoba. The pesticide label specifies how to use the product safely and effectively and it must be used according to label directions. Domestic class pesticides are ready-to-use products in small containers and are sold for home use. Commercial class pesticides are more concentrated products in large size containers and are sold for commercial uses such as in agriculture, forestry, industry, landscape services. Restricted class pesticides are products not for home and garden users and involve special requirements for use. Under Manitoba’s legislation, certain prescribed pesticides will be restricted from sale for use on lawns and adjoining areas and any exterior property of a school, hospital or child care centre that includes parking areas, pathways, any area around play structure where children play or access. Exceptions to these restrictions include protection of public health and safety including control of poisonous plants or invasive weeds. PMRA’s Homeowner Guidelines for Using Pesticides provides general homeowner guidelines on the proper use, storage and disposal of pesticides. See Use Pesticides Safely by PMRA for more safety tips. There are low-risk pesticides including biopesticides and other non-conventional pesticides as well as environmentally sustainable and economically competitive pest control tools and practices available in Canada. Biopesticides are derived from living organisms and their naturally-occurring metabolites suppress weeds, plant diseases and insect pests. Biopesticide products must be registered by PMRA to be sold and used in Manitoba. Some biopesticide products are sensitive to environmental conditions such as sunlight, rain, humidity or temperature. You can increase their effectiveness by applying during favorable environmental conditions. Already widely available to the public for other uses, with a history of safe use under conditions posing equivalent potential for exposure to humans and the environment. Corn Gluten Meal: All-natural corn gluten meal can be used as a pre-emergent herbicide, which inhibits root formation during germination. It controls crabgrass, dandelions and reduces the germination rate for curly dock, knotweed, lambs quarters, pigweed, and plantain. 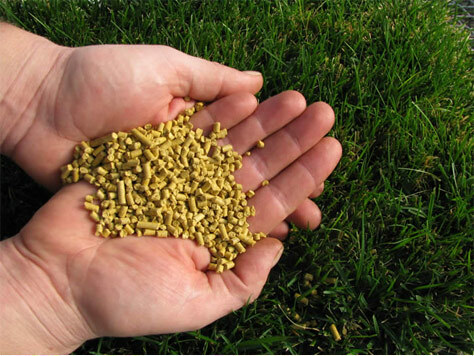 It contains 10% nitrogen by weight, thus making it an ideal "weed and feed” product. Please read How to use Corn Gluten Meal by Dr. Nick Christians for proper use of corn gluten meal. Corn gluten meal can be in fine yellow powder form or in gold pellets. The pellets are easier to use and are effective for up to six weeks. Iron Based Lawn Weed Killer: Iron based weed killers are effective in the treatment of broadleaf weeds in lawns, turf, parks, and playgrounds. Ontario Ministry of Agriculture, Food and Rural Affairs published a paper on Herbicidal Activity and Cost Effectiveness of Fiesta Chelated Iron in Broadcast and Targeted Applications to Turfgrass Infested with Dandelion, Broadleaf Plantain, and other Rosette weeds. The Guelph Turfgrass Institute has been conducting further research on these products. Photo credit: Cooperative Extension, University of Connecticut. Biopesticide: Biopesticides are derived from living organisms and their naturally-occurring metabolites suppress weeds, plant diseases and insect pests. Agriculture and Agri-Food Canada (AAFC) has invested in a National Biopesticide Programme for discovery and development of new biopesticide products for registration in Canada and worldwide. Contact Herbicide Products: Environmentally friendly contact herbicides containing acetic acid (vinegar), certain fatty acids (herbicidal soaps), ammonium soaps or salts of fatty acid, potassium salts of fatty acid, sodium chloride are registered by PMRA and available in the Canadian market. There are various programs throughout the province to raise awareness about safe lawn care. Landscape Manitoba works to develop a professional and skilled industry, and promotes awareness of the many benefits of beautiful, healthy and purposeful outdoor environments. Manitoba Agriculture, Food and Rural Development (MAFRD) : Growing Opportunities (GO) Centres of MAFRD are the front-line service delivery to valuable information and advice on noxious weeds and alien invasive plant species. Green Action Centre (GAC) is working to raise awareness about Pesticide Reduction. GAC also promotes composting for all Manitobans by providing information, resources and support. They assist residents interested in starting home composting. They also work with schools, workplaces, and communities to develop programs that address their unique requirements. Safe Lawn Care: Assists you to look after your lawn using safe lawn care methods and natural approaches to pest control.